I don't actually have cable and thus do not watch The Food Network, although I'm sure if I did there wouldn't be enough hours in the day to accommodate my cooking show obsession. Sometimes when I get the chance I will watch episodes online to feed my need. A couple months ago I was watching an episode of 30 Minute Meals and in the middle of this episode, I was salivating so much I had to wipe the puddle of drool off my chin. Stuffing Italian sausage meatballs with mozzarella and drenching them in pesto tomato sauce?! Are you freakin' kidding me? Why didn't I think of this??! While I didn't have the pleasure of coming up with this recipe, I did have the pleasure of devouring it. And it was just as good as I had imagined. It's incredibly easy too...very few ingredients, very little prep, with a BIG pay off. Place sausage in a bowl. Cut mozzarella into cubes (or use bocconcini). Using mozzarella instead of the bocconcini means you can save some money. Pick up about a tablespoon amount of sausage, press a cube of mozzarella into the center, and roll the sausage around it making a ball about 1 1/2 inches in diameter. Place on a baking sheet. Continue to roll all of the sausage and cheese into meatballs placing on the baking sheet when done. You should end up with about 14 meatballs. If your family likes more meatballs you might want to use more sausage, but using just 1 pound means you can get all the flavor and taste with less of a strain on your budget. Place baking sheet in the oven and bake for about 20 minutes. The cheese will leak out of some of the meatballs but don't worry. While the meatballs are baking, place the jar of pasta sauce in a medium saucepan over medium heat. Add the pesto, stir and simmer until the meatballs are finished baking. When the meatballs are done stir into the basil tomato sauce. Wow, our family loved these. This spin on a classic dish is lovely, fast and delicious. The way the original recipe is written it would be quite an expensive meal, but with the few changes I made it easily comes in under $10. I bought the most inexpensive jar of pasta sauce since doctored it up with pesto anyways, regular mozzarella works just as well as bocconcini, and pasta instead of cheesey mashed potatoes brings the overal price way down. 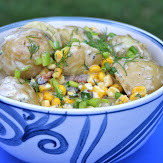 This recipe is being entered into the blog event Bookmarked Recipes. 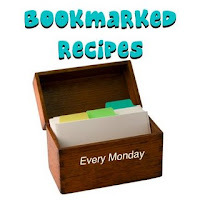 Each week bloggers from all over the blogosphere try a recipe they have bookmarked either from a website, magazine, cookbook, or food blog and they are gathered and posted every Monday. And for more great Rachael Ray recipes, check out Taste and Tell's Saturday's with Rachael Ray. Recipe looks great! I watch Food Netwok shows on HULU! Yay! You tried the recipe! I was honestly really excited when I saw this. I remember you mentioning this recipe a while back and have been meaning to try it myself ;) I'm so glad it turned out! Divya - I've never heard of HULU, what's that? Tara - Thanks so much sweetie! I saw that episode too! This recipe looks out of the world delish! Hulu is a free television website, www.hulu.com I catch up on shows like Glee, Gray's Anatomy, House, and Biggest Loser! They have full episodes, clips, and even some free movies. It's a wonderful website, I highly recommend it! Thanks for the recommendation Sherry! Unfortunately I am in Canada and Hulu is only available in the States. Boo! They've also changed the Foodnetwork website so that only people from the states can view it, so I can't catch up on the episodes anymore. We do have Foodnetwork Canada, but they only have the rights to show our Canadian shows online, not shows like 30 Minute Meals. But I am sure glad I saw this one online when I did....I was seriously drooling all over my keyboard! I do have cable, and a DVR - which makes it even worse!! I have many episodes of 30mm recorded that I haven't watched yet, so I know I'll be adding more to my list. And this one I'll be adding, too! Love your blog! Thanks! Thought I would let you know that there are probably ways around content not being available in Canada. My daughter spent several months in China and paid a few $/mo to get an IP address that made it look like she was somewhere else so that she could access Facebook...you would have to research it, but it was possible there!